Note: This article is a sidebar to this issue's feature story, "A River Once More." 1 cubic-foot per second (cfs) = 7.48 gallons per second or 646,000 gallons per day. Water rights from 43 acres of land were purchased in 1998 and 1999 and subsequently "dedicated" instream under Oregon’s instream flow law. The Deschutes River Conservancy, Oregon Water Trust, Deschutes County, Oregon Water Resources Department and the Upper Deschutes Watershed Council provided money for the purchases. Water rights from 15 acres of land were purchased by the Deschutes River Conservancy and the Oregon Water Trust and put instream. The Deschutes River Conservancy worked with the Three Sisters Irrigation District, Oregon Water Trust and a private landowner to relocate an irrigation diversion, which eliminated an existing ditch and associated water losses. The landowner’s flood irrigation system was also converted to a sprinkler system. Half of the conserved water was permanently returned instream. The Three Sisters Irrigation District piped 3.3 miles of the Fryrear Ditch in 2001 and permanently returned 1.5 cfs of senior water rights to Whychus Creek. The irrigation district carried out the project in cooperation with the Deschutes County Soil and Water Conservation District, the Deschutes River Conservancy, Oregon Water Trust and the U.S. Forest Service. The Three Sisters Irrigation District replaced approximately 2.8 miles of open ditch with pipe and saved four to five cfs. The Deschutes River Conservancy is working with Three Sisters Irrigation District to pipe approximately 2.1 miles of open irrigation ditch. Six cfs of water will be restored instream. The Three Sisters Irrigation District agreed to temporarily pump groundwater instead of surface water until additional irrigation-efficiency projects are completed, and leave a corresponding amount of surface water instream. The Deschutes River Conservancy leases irrigation water from farmers year-to-year to provide instream flows. The Deschutes Basin Land Trust has acquired four parcels of land to protect high-value steelhead spawning habitat from development. In 2008, the Upper Deschutes Watershed Council will begin restoring the creek’s natural course — which was "channelized" to prevent flooding in the 1960s — at two of the sites. The Deschutes River Conservancy and Upper Deschutes Watershed Council are working with individual landowners to install screens on irrigation headgates to prevent fish from getting sucked into farm fields, and add "fish ladders" to small dams to allow fish to continue migrating upstream. Information compiled by Matt Jenkins. 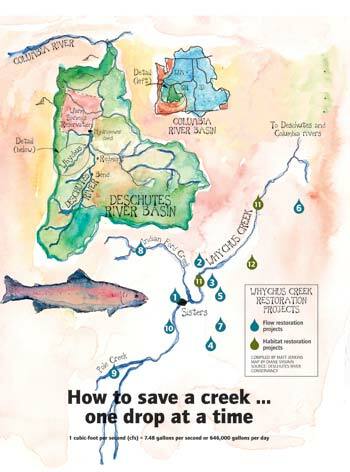 Source: Deschutes River Conservancy. Map by Diane Sylvain.